NASA's Mars Phoenix Lander can be seen parachuting down to Mars, in this image captured by the High Resolution Imaging Science Experiment (HiRISE) camera on NASA's Mars Reconnaissance Orbiter on May 25, 2008. 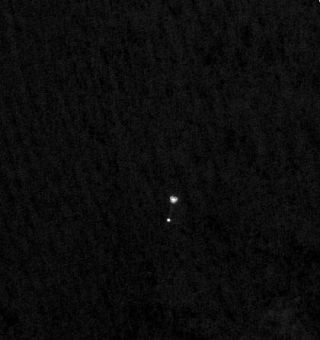 This is the first time that a spacecraft has imaged the final descent of another spacecraft onto a planetary body. PASADENA,Calif. – A NASA spacecraft circling the red planet caught a stunning snapshot ofthe Phoenix Mars Lander and its deployed parachute as it plummeted through theMartian atmosphere for a successful Sunday landing, NASA scientists announced Monday.It marks the first time that one spacecraft has imaged another?s final descentonto another planet. ?Thepicture is awesome,? said Phoenix principal investigator Peter Smith of theUniversity of Arizona at a briefing here at NASA?s Jet Propulsion Laboratory(JPL) today. Phoenix projectmanager Barry Goldstein of JPL said he had been skeptical about the ability ofthe Mars Reconnaissance Orbiter?s (MRO) HiRISE camera to catch a glimpse of thefalling Phoenix spacecraft during the brief,seven-minute descent. Theblack-and-white image reveals Phoenix?s 30-foot-wide (10-meter) parachute fullyinflated, with the spacecraft itself dangling below. The MRO spacecraft tookthe image while flying about 472 miles (760 km) above the Martian surface. ?This wasquite an engineering feat,? Goldstein said, hailing the MRO mission team?ssuccess. The $420 millionPhoenix mission, which launched in August, is designed to dig into the rock-hardlayers of water ice thought to lie beneath the surface in the planet?s arcticnorth. It will test the soil and ice for signs that the water was once liquid,and to see if it could have created a habitable zone for microbial life at somepoint in the past. Missionscientists here at JPL receivedthe signal that Phoenix had landed at around 7:53 p.m. EDT (2353 GMT) onSunday, though it currently takes signals about 15 minutes to cross the 171million-mile (275 million-km) gulf between Mars and Earth. Phoenix deployedits parachute while at an altitude of about 7.8 miles (12.6 km) above itsVastitas Borealis landing site. The spacecraft was traveling at about 1.7 timesthe speed of sound during the process. Mission scientists will use the imageand other data taken during the craft?s fiery descent to reconstruct Phoenix?slanding. They are especially interested since Phoenix?s parachute unfurledabout 6.5 seconds later than expected, pushing the probe?s descent near theedge of its target drop zone. Phoenix sentits first images a few hours after landing, bouncing them off NASA's MarsOdyssey orbiter to relay them to eager scientists back on Earth. The firstimage the lander took was of its solar arrays, both of which appear to havedeployed properly and are providing the spacecraft with energy. The landeralso sent back its first images of its landing site - the first that have everbeen taken of the Martian arctic terrain from the surface. The images showed aflat, cracked landscape with just a few pebbles strewn about. The cracks in thesurface had the same polygonal shape, caused by the expansion and contraction ofthe water ice below, that had previously been seen in images from the MROspacecraft. Thesepolygons were a bit smaller than expected though, said Smith, though hecautioned that this is just a fraction of the terrain that Phoenix will imageand that polygons on the other side of the spacecraft could be larger. ?This isour first look at the surface, we?ve only looked at one tiny little slit,?Smith said. ?Over the next few days we?ll be filling in the rest of it.? The troughsseen in surface images point to still-active arctic soils, otherwise the dentswould have been filled by dust blowing across the surface long ago, Smithsaid. This bodes well for the science mission, as ice layers still seem to beactive under the surface, he added. OvernightSunday, the science team at the University of Arizona in Tucson sent Phoenixits instructions for today, which include checking out some of the lander?s instruments.They are expecting to get another set of images from the spacecraft thisevening. NASA'snext Phoenix mission briefing will be broadcast live on NASA TV at 2:00 p.m.EDT (1600 GMT) on Tuesday, May 27. Clickhere for SPACE.com'sPhoenix mission coverage and a linkto NASA TV.